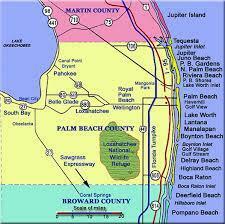 Palm Beach County is the second largest county in the state of Florida in total area, behind Monroe County. It also ranks second in land area, with the county being slightly smaller than Collier County. Situated in the Miami metropolitan area and South Florida, Palm Beach County's modern-day boundaries were established in 1963 – from the Atlantic Ocean westward to Hendry County and from the village of Tequesta southward to the Hillsboro Canal at the city limits of Boca Raton. The largest city and county seat is West Palm Beach. Other large cities include Boca Raton, Boynton Beach, Delray Beach, Wellington, and Jupiter. With 1,356,545 residents, Palm Beach County ranks as third in population in the state of Florida, and twenty-eighth most populous in the United States, as of the 2010 Census. Named after one of its oldest settlements, Palm Beach, the county was established in 1909, after being split from Miami-Dade County. The area had been increasing in population since the late 19th century, with the incorporation of West Palm Beach in 1894 and after Henry Flagler extended the Florida East Coast Railway and built the Royal Poinciana Hotel, The Breakers, and Whitehall. In 1928, the Okeechobee hurricane struck West Palm Beach and caused thousands of deaths. Since then, a number of other tropical cyclones have impacted the area. More recently, the county acquired national attention during the 2000 presidential election, when a controversial recount occurred. As of 2004, Palm Beach County is Florida's wealthiest county, with a per capita personal income of $44,518. Among the first residents in Palm Beach County were African Americans and many of whom were former slaves or immediate descendants of former slaves who had escaped to the State of Florida from slave plantations located in Alabama, Georgia and South Carolina. Runaway African slaves started coming to what was then named Spanish Florida in the late 17th century and they found refuge among the Seminole Native Americans. Henry Flagler, who made his home in Palm Beach, was instrumental in the county's development in the early 20th century with the extension of the Florida East Coast Railway through the county from Jacksonville to Key West. While Palm Beach county’s biggest industries are tourism and agriculture, it is also home to many corporations including Scripps, a large bio-science research company located in Jupiter. Office Depot has their headquarters in Boca Raton. It is also the spring training home to the Miami Marlins and St. Louis Cardinals. The PGA headquarters are located in Palm Beach Gardens which also hosts the Honda Classic golf tournament each year. Wellington hosts the largest and longest running horse show in the winter and it is the home of the U.S. Open Polo Tournament each April. Each spring West Palm Beach is home to Sunfest, a cultural and entertainment event held along the lakefront downtown. City Place, just west of downtown is an upscale shopping, dining and entertainment section that holds numerous events throughout the year. Palm Beach County public schools are among the best in the state and in addition to having Palm Beach State College and Florida Atlantic University there are numerous private schools offering all types of educational opportunities. All types of housing are available in Palm Beach county. They include retirement, family, private, golf course, and waterfront communities. Prices range from very affordable to very expensive.